I’m really excited for Hallloween. I’m going to be something from Star Wars. I can’t say yet because it’s a pwuhlize. But it is so radital and I got a new light saber for my costume. Today i started my first gymnastics class. It was a lot of fun and I got to do the balance beam backwards. My friends Amelia and Madison are in the class! Last night my daddy and I carved pomptins. I told my dad what to do and drawed some parts on paper for dad to do on the pomptin. I like them to be really really scary. I have lots of ideas for daddy to cut out. I help with some cutting and i love to push the pieces out once they’re cut out. This is my scariest pomptin. he has crazy eyes and nose, stripey war paint and a double chin (like my brother!). In this photo you can see my upside-down pomptin and my alien pomptin with five eyes and two mouthis. I like to unvestigate for slimey slugs in my creations. 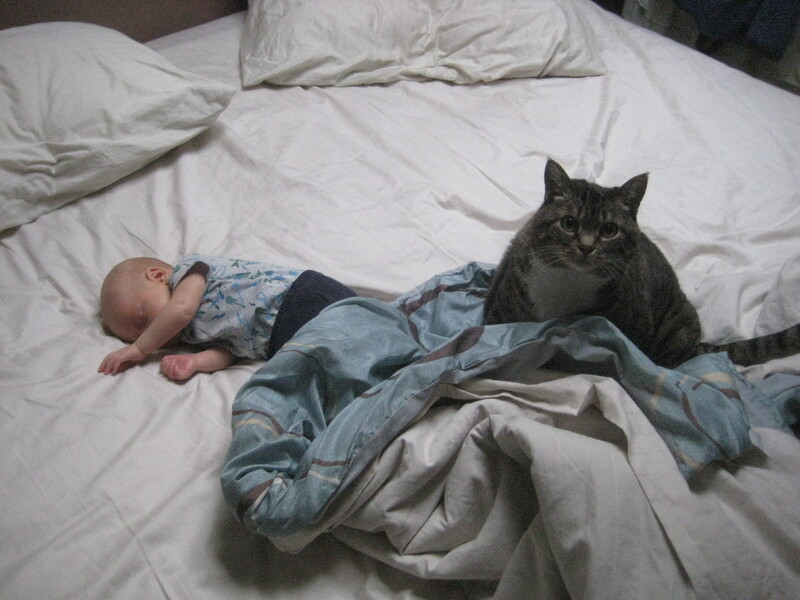 Fat cat or teeny baby? yesterday i went to the wilkes halloween carnival with my Nanny. it was super fun and i had muts fun with nanny. then we went to my great grandma Nana’s house. she has a mownifying glass and i like to be sid the science kid and do unvestigations. i vestigated if my baby is cute. he is. Last week I got to go to the pomptin patch 2 times. Once with my mom, dad, brother, nanny, pappy and apple. The other time was a field trip with my friends. I picked out the biggest pomptin in a whole world. Mmmmmm. My Pappy took me to the Fire Fighters Pancake Breakfast on Saturday. It was delississ! A few days ago I got to do something really cool with my mom and dad and brother. 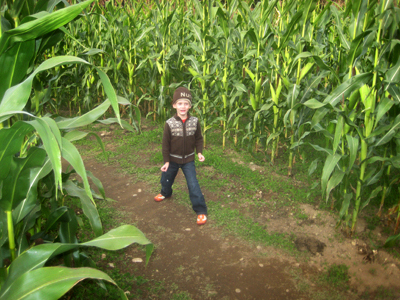 We went to a corn maze in Kingston. It was a really long drive–like 20 minutes–and I got grumpy because it was taking forEVER. But then we got there and it was so awesome. I got to to the corn maze, a hay maze, make s’mores, race tricyles, jump in hay and shoot pumpkins of of a sling shot. I leaded the way on the maze and found all six stations AND got us out alive. My mom and dad were very excited that I was so good on the maze. I think everyone should go to the Sunrise Hill Farm corn maze, epspecially A.J. and Rivers. I want to go back and I might get to. juliag on June 2009… Finally!